Protein splicing domains, also called inteins, have become a powerful biotechnological tool for applications involving molecular biology and protein engineering. Early applications of inteins focused on self-cleaving affinity tags, generation of recombinant polypeptide α-thioesters for the production of semisynthetic proteins and backbone cyclized polypeptides. The discovery of naturallyoccurring split-inteins has allowed the development of novel approaches for the selective modification of proteins both in vitro and in vivo. 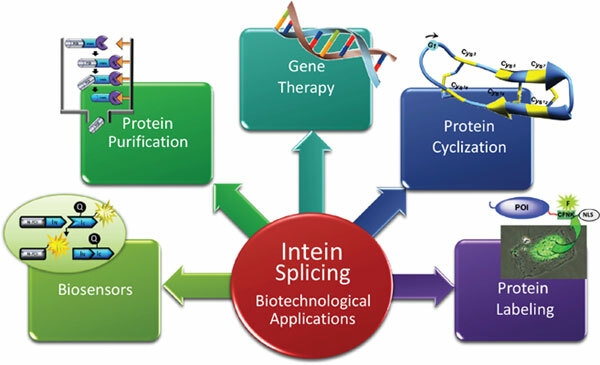 This review gives a general introduction to protein splicing with a focus on their role in expanding the applications of intein-based technologies in protein engineering and chemical biology. Inteins, split-inteins, protein modification, protein trans-splicing, protein splicing, post-translational modification, conditional protein splicing, backbone cyclized proteins.